The Hawaii Department of Transportation (HDOT) responded to flooding events on Kauai late Monday, Aug. 27, 2018. 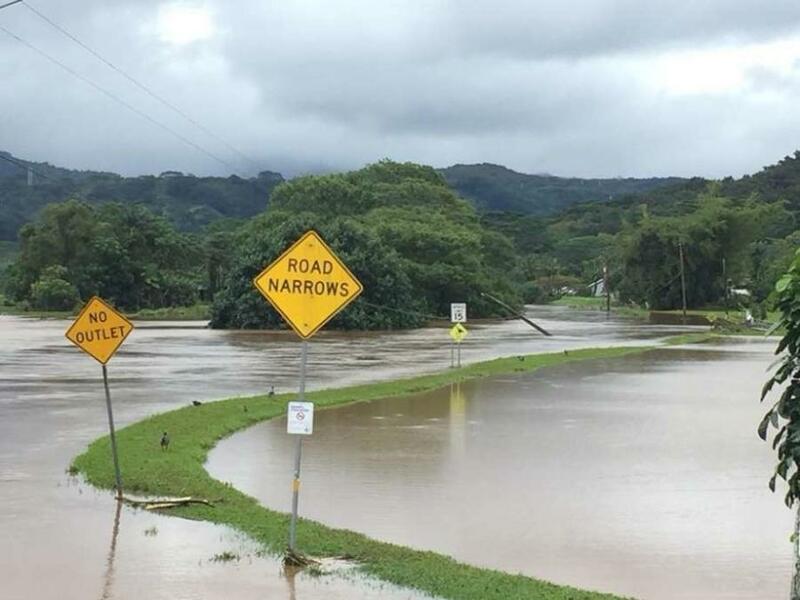 HDOT engaged in flood response on Kauai and Oahu on Aug. 28, 2018. The preliminary 24-hour rainfall total for Hanalei as of 6 p.m. was 11 in. This resulted in the continuing closure of Kuhio Highway at Hanalei Bridge and on the road between Waikoko and Wainiha. HDOT Highways Division Kauai District plans to clean mud and debris from the roadways once flood waters recede and to continue repair work on Kuhio Highway at mile marker 1, which saw rockfall and a fallen tree the evening of Aug. 27. Travel on Kuhio Highway at mile marker 1 (the hill leading up to Hanalei Bridge) will be contraflowed as additional emergency repairs are made to the slope. The hours for the alternating one-lane access will be given after assessment of the area and weather conditions. HDOT Highways Division Oahu District responded to flood related closures of Likelike Highway between Valley View Drive and Nalanieha Street in both directions and cleared Honolulu-bound lanes as of 9:25 a.m., Aug. 28, 2018. HDOT crews also cleared a small landslide on the eastbound H-201 Moanalua Freeway before the Puuloa Off Ramp and removed flood debris from underneath the Kalihi Stream Bridge on Dilligham Street (area before Middle Street). Removal of the flood debris beneath the bridge engaged HDOT crews and contractor HTM, until 6 p.m. on Aug. 28. The Contraflow was opened Aug. 29 between 5 a.m. to 8 a.m. for those with two or more in their vehicle, motorcycles, electric vehicles with proper licenses, and permit holders. Contraflow users were asked to use caution when entering the contraflow and to avoid entering before the 5 a.m. opening time for their safety and the safety of the crew setting up the lane. Assessment teams from HDOT, Federal Highways Administration, and Central Federal Lands deployed to Maui and Hawaii Island to conduct an in-depth analysis of damages from Hurricane Lane and the Lahaina Fire. These assessments will inform the plan for recovery and repair of the affected routes. An update will be provided once the plan for recovery is determined. For updates, follow HDOT on social media: facebook.com/HawaiiDepartmentOfTransportation/ and twitter.com/DOTHawaii.